Says most likely scenario is "Brexit in name only"
If Prime Minister Theresa May allows Brexit to be watered down or halted by supporters of European Union membership, Britain will be thrust into its gravest constitutional crisis since World War Two, Brexit campaigner Nigel Farage said. Farage, who as UKIP leader convinced Prime Minister Theresa May’s predecessor, David Cameron, to call the Brexit referendum and then helped lead the campaign to leave the EU, said Brexit was now in danger of being scuttled by the establishment. The 53-year-old former commodities trader cast May, who voted to stay in the EU, as "Theresa the appeaser" for giving in to Brussels on almost every element of Brexit negotiations and said Britain was being humiliated by the EU. "The best-case scenario right now under our current pathetic leadership is Brexit in name only - that is about as good as it gets," Farage told Reuters in his office a few metres from Westminster Abbey. "At worst they are going to make us fight the whole thing again," said Farage. "That is a significant betrayal of what many millions voted for." In the United Kingdom's 2016 referendum, 51.9 percent, or 17.4 million people, voted to leave the EU while 48.1 percent, or 16.1 million, voted to stay. 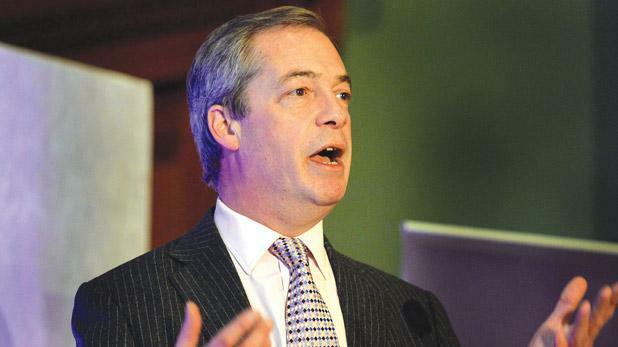 Farage was once ridiculed by Cameron as the leader of a bunch of "fruitcakes and loonies and closet racists". A supporter of U.S. President Donald Trump, he revels - between jokes and cigarettes - in the role he played in what he calls the "Brexit revolution". He dismissed worries from major banks such as Goldman Sachs that the City of London could lose business as a result of Brexit and cast the European Union as a doomed German-dominated experiment in European integration. Since the referendum, supporters of EU membership have been exploring a range of legal and political methods to prevent what they see as a colossal historical mistake. May, whose government and party is divided over Brexit, has just eight months to strike a withdrawal deal with the EU but insists Britain will leave at 2300 GMT on March 29, 2019. Opponents of Brexit are trying to garner enough support in the lower house of parliament, the House of Commons, to block any possible withdrawal deal May brings back from Brussels in October. "The real crunch point is ultimately going to be the meaningful vote in the House of Commons on whatever deal we get and that is the point at which it is not impossible to see this country plunged into a constitutional crisis," Farage said. "The chances of this being the case get higher with every week that goes by," he said. "If the deal is rejected on a confidence motion, then you are looking at general elections or you are looking at another referendum." French President Emmanuel Macron and European Council President Donald Tusk have raised the prospect of Britain changing its mind on Brexit. Among those who have called for Brexit to be halted are former Prime Minister Tony Blair, Goldman Sachs Group Inc Chief Executive Lloyd Blankfein and George Soros, who made a huge fortune by betting against the British pound in 1992. Asked about the three, Farage laughed: "If I was drafting a horror movie of what remainers look like, well here they are." Trump, he said, was doing very well as president and described allegations of links to Moscow as hysteria. "This Russia inquiry is one of the biggest hoaxes we have seen in our lifetimes," Farage said, scoffing at claims about his own links to Russia or Russia's supposed role in Brexit. "It is complete and utter total complete rubbish," he said. "I may have drunk a vodka once but I have never been to Russia." Farage said that instead of Russia, Soros should be investigated. The Hungarian-born billionaire's foundations have pledged large sums to Best for Britain and other pro-EU groups. "There does need to be an investigation into the extent that George Soros is undermining politics right across the Western world," Farage said. "This is the biggest political campaigning organisation the world has ever seen and most people are in denial about it." He dismissed criticism from some British commentators that accusing Soros of a conspiracy had shades of anti-Semitism: "What? We cant criticise the man because he happened to come from a Jewish background? He is not Jewish - he is an atheist." A Soros spokesman declined to comment on Farage's remarks.